Only required to use the lap belt. Required to use both the lap and shoulder belts. Only required to use the shoulder belt. If your vehicle is equipped with a lap belt and a separate shoulder belt, you are required to use both. The "Basic Speed Law" states that you may never drive faster than is safe for current conditions. For example, if you drive at 45 mph in a 55 mph zone during a dense fog, even though you are below the posted limit, you may be cited for driving "too fast for conditions." 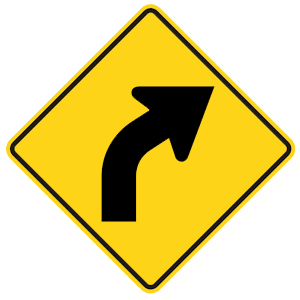 Warning signs are usually yellow with black markings. 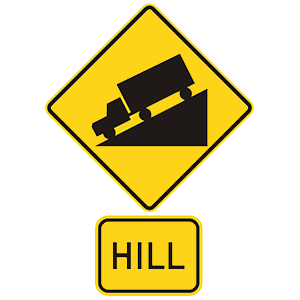 This sign indicates that there is a steep hill ahead. Slow down and be ready to shift to a lower gear to control your speed and protect your brakes from damage.